Location: Rt. 519 Directions: From junction of US-60W & Rt. 519 (at signal light in Morehead), go about six miles south on Rt. 519. Barn is at left across the pasture. Notes: Barn owner didn’t specify a quilt pattern – just wanted a quilt block with bright colors that could easily be seen from the road. Quilt block chosen is based on a beautiful quilt owned by one of the local quilt square committee members. 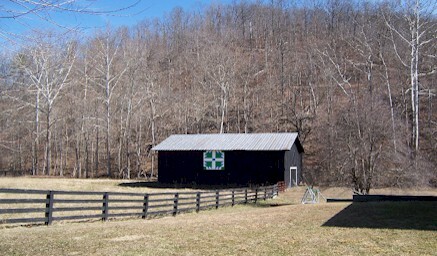 Barn is just a few miles from the Morgan County line.